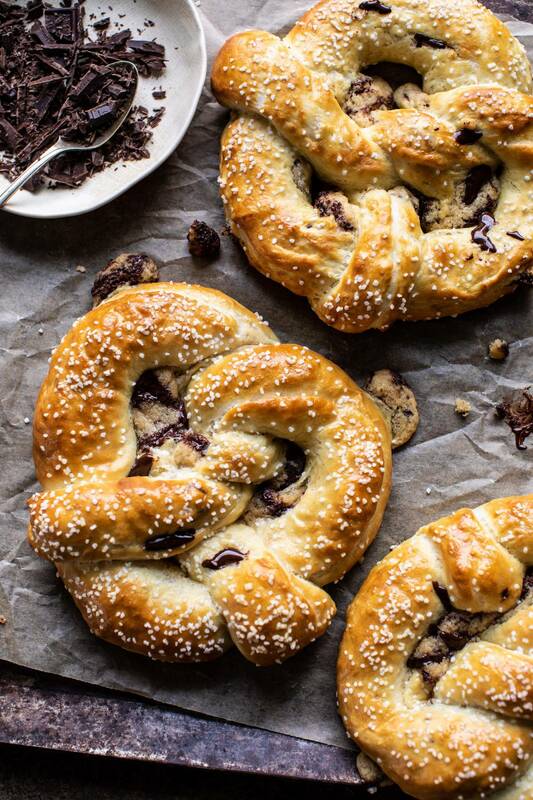 Welcoming in February with the best warm Chocolate Chip Cookie Stuffed Soft Pretzels. 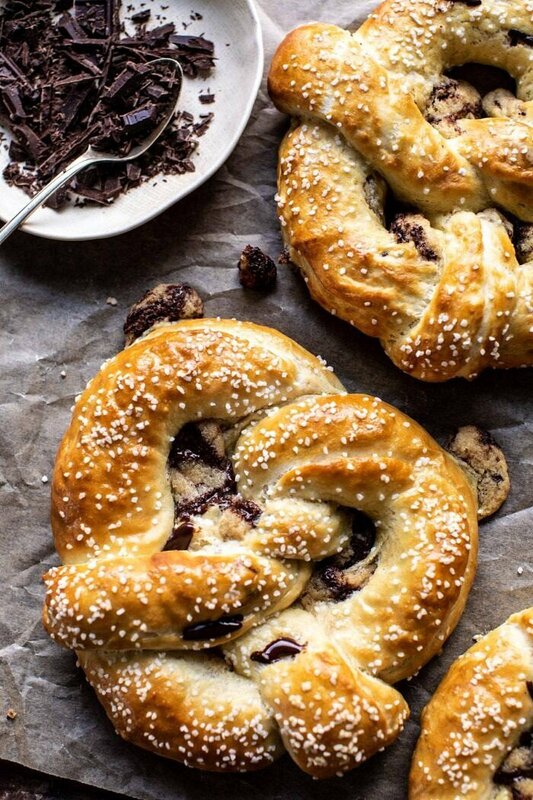 Homemade soft pretzel dough, stuffed with homemade chocolate chip cookie dough, shaped into pretzels, and baked until golden on the outside, and soft and gooey inside. 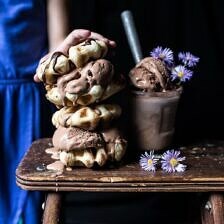 These pretzels are every bit as delicious as you’re imagining, and make for the perfect indulgent dessert any day of the week. Meaning…when you’re in need of a really good chocolate fix! Word on the street is that many of you are experiencing temperatures of -20 degrees. At least that’s what I’m seeing come through my DM’s on Instagram. Honestly, even though I live in the cold and snowy mountains of Colorado, I still think that’s wayyyy too cold. We are not experiencing these -20 degree temperatures, but I’m feeling sympathy for all of you out there who are. And to show my support, I baked us up the very best weekend treat I could possibly imagine. Because when it’s too cold to leave your house, there’s no better use of your time than to bake. Especially when it’s literally freezing outside, and especially after a long week. Anyone else so happy it’s finally Friday? I know I am. I’m also excited to share these pretzels with you all, and to welcome in the month of February. I actually loved January, but with February comes the excitement of longer days, fresh-cut flowers, and chocolates for Valentine’s Day. In general, just a fun month ahead. OH! And today is my brother Brendan’s birthday! See, it’s such a good day. Hmm, let’s see, he’s 29 today! Wishing I could share these pretzels with him, but I’m sure he’s eating well and enjoying the Cali sunshine. OK, moving along, let’s talk details. So I made these cookie stuffed pretzels years and years ago, but I think I love them more this year. I mean, my gosh, these are quite possibly one of the best desserts I’ve ever come up with. They’re warm, chocolatey, doughy, a little salty, and all kinds of delicious. Start with the pretzel dough. Don’t fear it, it’s so easy. You just need a handful of ingredients, mostly water, flour, and a little bit of time. While the dough is rising, make the cookie dough. Now, I just used my favorite homemade cookie dough. Since these pretzels are a little over the top as is, I didn’t want to overwhelm things with a fancy cookie dough. Sometimes simple is best. That said, I did switch it up slightly by using semi-sweet chocolate chunks, but you can use chocolate chips or chocolate chunks, either is great. 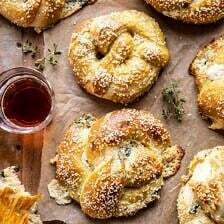 To assemble, simply roll the pretzel dough out into ropes, flatten, add a little cookie dough to the center, seal, and form the dough into pretzels (see photos for references). I will say that your first pretzel is most likely going to look the worst. There will probably be a few holes throughout the dough. DO NOT let this scare you off. Having a few holes in the dough is totally fine and just leaves room for the cookies to ooze out a little while baking, which is delicious for the end results. So don’t stress. As you continue to make and shape the pretzel, each will get a little easier and you’ll get the hang of things. The bottom line, no matter what your pretzels end up looking like, they will, without a doubt, taste DELICIOUS! And that’s all that matters. Basically every other week is ideal. 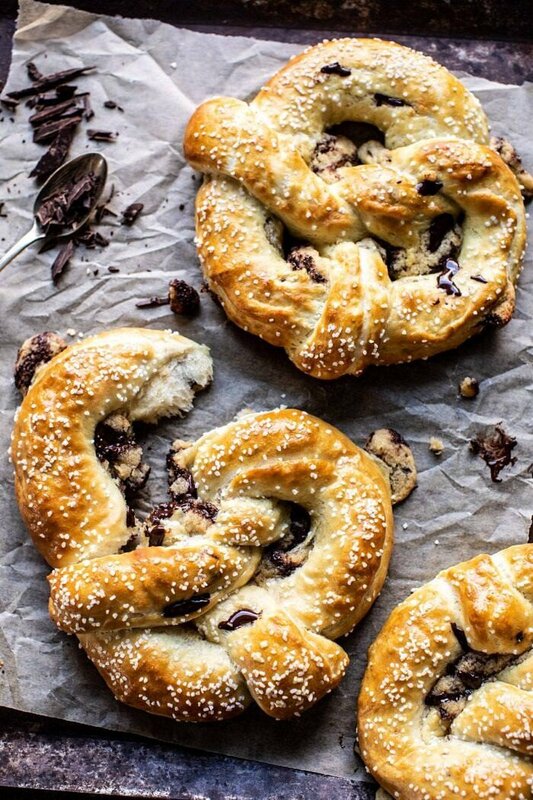 Because salty soft pretzels + chocolate chip cookie dough is truly what you lay awake at night dreaming about. Happy Friday guys! Stay warm and enjoy some seriously good cookies this weekend! 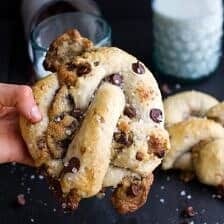 If you make the cookie stuffed soft pretzels, be sure to leave a comment and/or give this recipe a rating! Above all, I love to hear from you guys and always do my best to respond to each and every comment. And of course, if you do make this recipe, don’t forget to also tag me on Instagram! Looking through the photos of recipes you all have made is my favorite! 1. Combine the water, honey, and yeast in the bowl of a stand mixer and mix with the dough hook until combined. Let sit for 5 minutes. 2. Add the melted butter, salt, and flour to the mixture and mix on low-speed until combined. Increase the speed to medium and continue kneading until the dough is smooth and begins to pull away from the sides of the bowl, about 3 to 4 minutes. If the dough appears too wet, add additional flour, 1 tablespoon at a time. Remove the dough from the bowl, place on a flat surface and knead into a ball with your hands. Coat a large bowl with oil, add the dough and turn to coat with the oil. Cover with a clean towel or plastic wrap and place in a warm spot until the dough doubles in size. This will take about 1 hour. 3. Meanwhile, make the cookie dough. In a large mixing bowl, beat together the butter, brown sugar and sugar until combined. Add the eggs, one at a time, beating until combined and creamy. Beat in the vanilla. Add the flour, and baking soda, beat until combined. Stir in the the chocolate chips. 4. Preheat the oven to 425 degrees F. Fill a large bowl with warm water. 5. Divide the pretzel dough into 8 equal balls and roll each out into a rectangle (about 11x3 inches). Spread about 1 1/2-2 tablespoons cookie dough along the length of each piece. 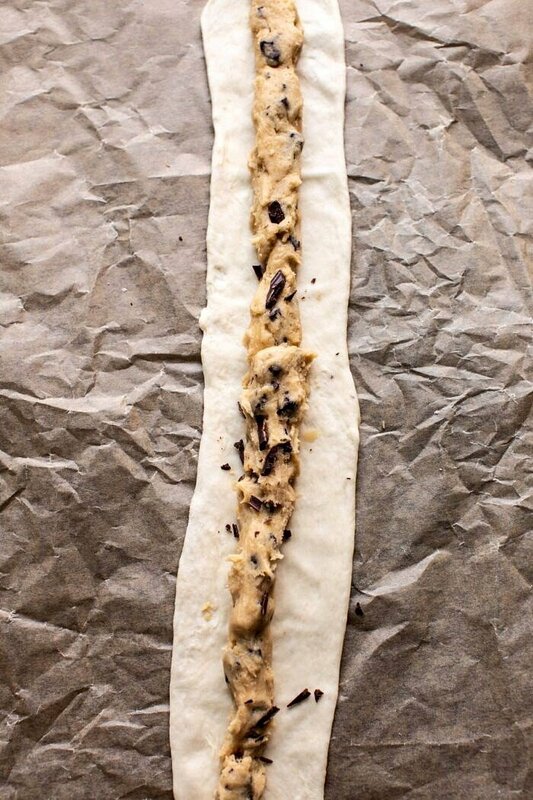 Starting with the opposite side, roll the dough up into a log, enclosing the toppings inside. Pinch the seams together. Very gently roll the dough with your hands to form an even cylinder and fully enclose the filling (see above photos). 6. 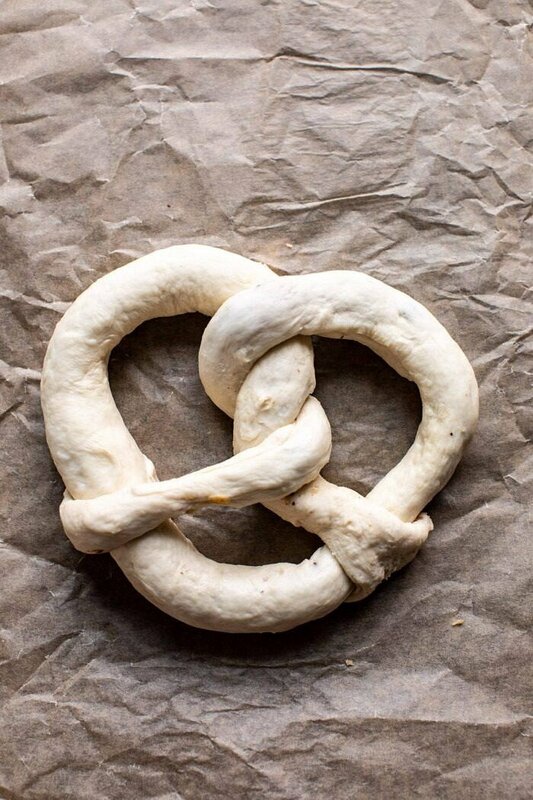 To shape into pretzels, take the right side and cross over to the left. Cross right to left again and flip up. Add 2 tablespoons baking soda to the bowl of warm water. Submerge the pretzels in the water, 2 at a time for 30 seconds. Remove and transfer to a parchment paper lined baking sheet, placing 4 pretzels on each baking sheet. Brush the tops with the beaten egg wash and season liberally with salt. Bake for 15 to 18 minutes or until pretzels are golden brown. 7. Remove pretzels from oven and let cool 5 minutes. Serve and enjoy! If needed, the pretzels can be reheated in a 350 degrees F. for 5 minutes. Warm chocolate Chip Cookie Stuffed Soft Pretzels + Video. 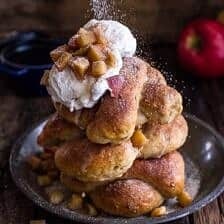 Hot Buttered Rum Apple Pie Stuffed Cinnamon Sugar Soft Pretzels. oooh this is really decadent!! YES! I hope you try this Ruth! Thank you! I am so glad you like this Charlotte! 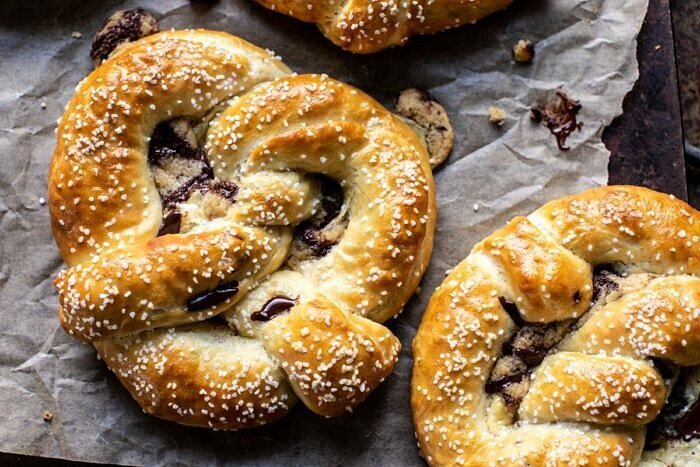 Stuffing a pretzel with cookie dough is a brilliant idea! One of these with my morning coffee right now would be heavenly! Thank you so much! Ooo with coffee?! Yes please! I hope you love this! Yes, this is lazy, but could I use the pre-made toll house cookie dough to save a little time? 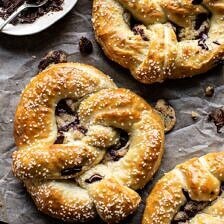 The bakery section of my local grocery store is now selling pretzels that are made out of what I think is puff pastry with a semisweet chocolate filling sprinkled with salt. I’ve been trying to figure out how to recreate them, though it’s probably better not to have them around! These look like an alternate version. Does the cookie dough filling get crispy at all when it is cooked? These look like they would be equally as dangerous to have around! Hi Jean! That sounds amazing and super similar!! I hope you try these and they turn out amazing for you!! I can’t even. I thought it was over the top when you did the ones stuffed with spinach artichoke dip, but these are insane! Mine, of course, would end up looking like…. I can’t even come up with a description, but it wouldn’t be pretty. But I think it would be worth a shot to try them out! Superbowl party, here we come! YES! I hope you loved these pretzels, Christin! Thank you so much! I made these a few years ago for my birthday and they were insanely good. I’m looking forward to revisiting them with this revamped version! Thank you so much Megan! I am so glad you loved these and I hope you love the new version as well! Yessss so glad you resurrected these pretzels! I think these are honestly my fave dessert and the single recipe I’ve made the most from your blog! Thanks for reminding me to make them again, they are definitely happening this weekend! Thank you so much Jasmin! I am so glad you loved this before and I hope you love this one! This is the recipe that brought me to your site several years ago! Your amazing recipes and beautiful photography has kept me here! 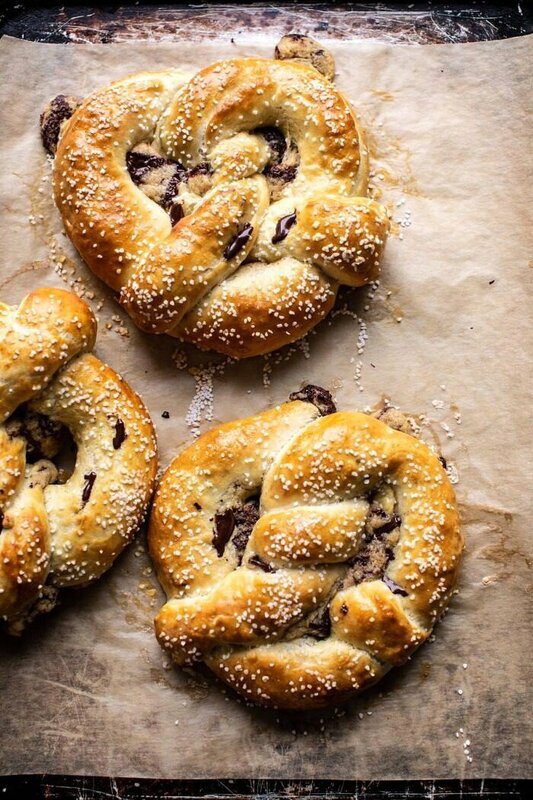 These pretzels are over the top, but oh so amazing! Thank you so much Kim! I am so happy to hear that! You are a genius. Little hearts are shooting out of my eyes at this recipe like a heart-eyed emoji. Ah I am so glad you love this! Thank you so much Christine! Thank you so much!! I hope you love these Kristen! Are you kidding me!!! I’ll be making these tomorrow! YES!! I hope you love these Heather! Thank you! i am dying to make this recipe for my husband but i don’t have a mixer. do you think i could pull this off by hand? i’m also wondering if i could replace the eggs with flax eggs or something similar. thoughts? Totally fun recipe. Love the idea and can’t wait to make. Thank you so much Joyce! I hope you love these! These sound ridiculously delicious Tieghan! What a treat! I had to make these after you posted about them on Instagram. I’m currently DEVOURING one. I love the sweet and salty combo. Absolutely delicious and so simple! Thank you!! YES! I love to hear that! Thank you so much Kacie! The pictures look amazing, and even though it sounds enticing, the end product was strange. Found out after making them, that usually pretzels are boiled in soda water, then baked. In this recipe, putting them in warm soda water for 30 second causes the dough to dissolve. So I only dipped the rest quickly before baking. I was able to shape them correctly but the missing boiling instructions, caused them to puff large in the oven, losing the desired shape. The cookie dough also cooked faster, and erupted out of the dough in spouts. In the end the cookie part was crunchy. Maybe fixing the instructions will result in a better end product. Not a pretzel that one would dip in a delightful cheese fondue though. Hi! I am so glad you like the photos but are there any questions I can help you with for this recipe? Please let me know! Yup these turned out perfect though the color on mine doesn’t look as good as yours but they tasted amazing. The recipe is quick to assemble and felt so effortless, granted that could of been cause I was so excited about trying them! I am so glad you loved these Andii! Will try to make your recipe soon! I hope you love this recipe, Eva! Thank you so much! YUM!!!! These turned out sooo good! Also made half the batch as plain pretzels with the same recipe, I just didn’t stuff them… made a version of your buffalo cheese dip from another recipe, and my family devoured them all within half an hour! Wow that is so amazing to hear Gill! Thank you so much! Hey Dunkin, I am thinking you have the wrong cookie recipe? Can you check the recipe you have a question for? thanks! Two of my favorite things!! Love the sweet and salty vibes! Excited to make these! Can I assemble the pretzels ahead of time, and store in the fridge or freezer, or would this affect the dough? 1. just like someone else mentioned, when i dipped the pretzels in the baking soda solution, they started weirdly dissolving. i ended up racing through this step, and i’m not sure how it affected the final product. 2. i started out using 2 tbsp of cookie dough per pretzel, but after a couple pretzels i realized i was never going to use up all the cookie dough, so i increased it to about 3 tbsp each, and still by the end i had a massive amount of cookie dough left! i have no idea how anyone else didn’t run into this same thing… i’m not sure i even used up half the cookie dough! did i totally misinterpret a step or something? they still tasted good, but i wanted more cookie in the cookie/pretzel ratio. HI Alyssa, It is really hard for me to know what is happening since you’ve changed a lot about the recipe. I am not sure how your changes have affected the dough. So sorry, but I don’t really know how to answer your question. In general, there will always be dough leftover, but only about 1/4 of the cookies dough should be left. let me know if there is anything else I can help with. Made this for our movie night last night & the kids loved them. We watched Tim Burton’s Alice in Wonderland. & i think the dessert was fitting, the crazy combo of a pretzel & choco chip cookie… it was like we went down the rabbit hole too! LOL! who would have thought that it goes so good together. Great recipe me & the kids couldn’t stop eating it.